Red Bull’s Helmut Marko says that Mark Webber knew he was slower than the pursuing Sebastian Vettel in Istanbul, and should have let his team mate through. Intriguingly Christian Horner told this blog today that just before the accident Webber had radioed the team and asked that Vettel should back off a little. That would tend to support Marko’s contention that Vettel had more speed and, with Hamilton right on his tail, couldn’t really reduce the pressure on the leader. “Mark for whatever reason was slower,” Marko told this blog after the race. “He was getting lap by lap slower, and Vettel was getting faster and was coming under enormous pressure from Hamilton. So if he would have stayed behind Mark, he would have been overtaken. So he had to do something. And Mark knew that he was slower, so he should have let him past. Had Webber not pitted for a new nose – an endplate was missing – he might have been able to keep the pressure on the McLarens as they went into fuel saving mode. But Marko has no regrets about the stop. The Austrian doesn’t think that McLaren have made a dramatic step forward, and says that the Istanbul straights simply suited the F-Duct. But that of course means that the next two races, which are essentially straights and slow corners, will favour McLaren more than Red Bull. Vettel unlucky? I think his move was stupid and arrogant. It is impossible to tell, but it seems that he assumed that his teammate is going to move over and give him the racing line. Webber set himself up to have the inside line for turn 13 so he could regain P1. I would suggest that if Hamilton was the one pulling that move, Webber would have put Hamilton on the grass. Webber gave Vettel just enough to either make the pass or hang himself, and we all know what happened!! I think the way that Red Bull are spinning this is hilarious. There story does not add up at all. They claim that the 1-2 finish was the most important, but then go on to say that Vettel “had” to pass Webber in order to stay ahead of Hamilton. Quite how did they then expect Mark to stay ahead of Hamilton with a slower car than Seb to keep the 1-2 intact? It seems to me that the best way to maintain the 1-2 finish was to have Vettel protect Webber – his superior straight line speed could far better defend the F-duct’d McLaren of Hamilton. They really have not thought this explanation through clearly. I have no doubt they are prioritising Vettel, and expect Webber to be out (by his own choice) at the end of the season. These quotes say it all for me. ‘For whatever reason?’ The only reason he was slower is because the Red Bull team had made him slower. That team is trying to give Vettel a clear run at the championship whilst throwing as many obstacles in Mark Webber’s way as they possibly can. After Monaco, all the indications coming from Red Bull were that they were going to offer Mark a new contract. Can you see this weekend being significant in whether or not that will now happen? Not sure if anyone has seen but there is an interesting video from Mark on the official RBR website about the incident. Marko makes it ‘sound’ plausible, except when you view Webber’s fastest lap posted on Lap 54 (accident on lap 40). How does he explain that? or it conveniently overlooked? Well, for starters, he’s 15 laps (roughly 30+ kgs) lighter on fuel. Lighter on fuel and also new tyres during the stop for the nose. I’m sure the Red Bulls would be real easy to pass, Not! Marko makes it sound like a little extra pace is all you need to pass in F1, Red Bulls cornering advantage would offset McLaren straight line speed combined with dirty air & a very wide Red Bull passing cannot be assumed. Webber “should have let him past”??!! Not a chance. Imagine you are tied for the lead in the championship, and leading the race. Your main rival makes a move. You don’t let him past. Not even if he’s your teammate. You wouldn’t even let your mother past in those circumstances. You don’t chop him or drive into him, but you don’t give him room. You make him work like hell for every inch of advantage he gains. Had Webber made room, that would send Marko and Horner and the whole world one message: he’s not championship material. Mark proved that he is. What is with these Red Bull conehead managers? Horner and Marko need a can of Bull piss shoved where the sun don’t shine. Webber, with all the class in the world deflects spewing it all out to the media and tells them “to dig deeper” in search for why Vettel was faster-End of Story!!!!!! How can Red Bull continue to be so boneheaded to support some upstart like Vettel who continues to show his brain is not doing the driving. Vettel is exceptional but obiously not as solid a driver as Webber and certainly not nearly as classy. Maybe Mateschitz thinks he can sell more of that Bull piss with the antics of Vettel, possibly. However, if he wants to see a can of that on a dinner table in Monaco he better stick by Webber !!! maybe vettel didnt want to do just defending … he wanted to win .so he plain refused to hold station . On the other hand, Vettel was actually faster than Hamilton on two of the three laps before the collision and only marginally slower on the third lap. So how can Dr Marko make a claim that Hamilton was putting pressure on Vettel when the lap times of the two of them clearly show otherwise? Marko is, what we in Texas would call, “full of crap”. is the problem at Red Bull more management related. They seem to make too many mistakes but they are a young team and maybe this is another step in ecperience. I hope they create an equal opportunity for both drivers and not favour one. Alonso should send a thank you to Red Bull because at the beginning of the race, the big question was what happened to Ferrari. A great spot from Todfod on another blog: Horner is clearly seen saying ‘Come on Mark, MOVE’ in the TV Coverage. Red Bull blame Mark for it. So does Vettel. It’s not Webbers team is it? vettel doesnt make much of a steering input to turn into mark does he ? 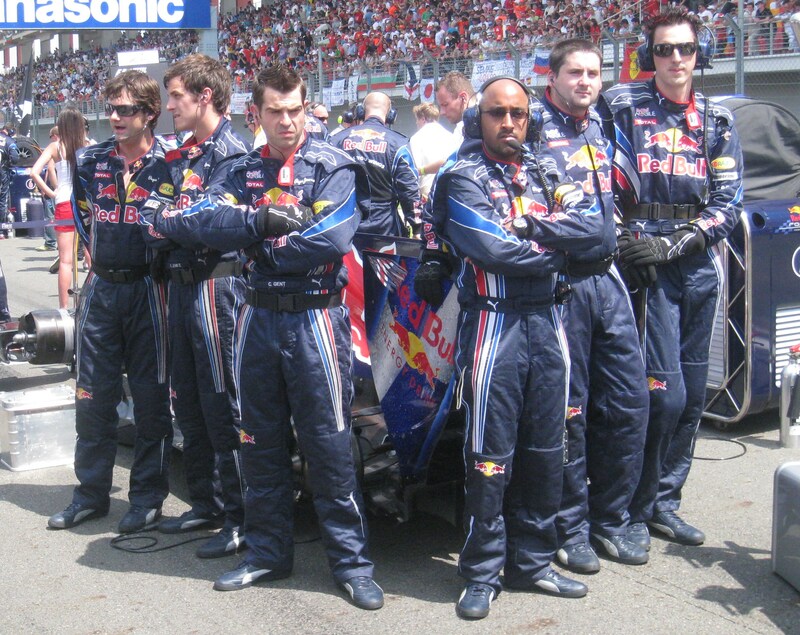 If I was Mark Webber, I’d be feeling VERY aggrieved right now. Remember many people thought he was going to retire before the beginning of this year. Perhaps Red Bull thought so too..
Last year after the race at the Nurburgring, I went into the Red Bull motorhome to congratulate Mark Webber on his first Formula 1 victory. There was no sign of Webber, but team principal Christian Horner and Dr Helmut Marko were deep in conversation next to the bar. Both looked pretty serious. Webber had won the race while Vettel had finished second, largely due to being rather tentative in qualifying, where he ended up fourth. I watched him very closely that weekend and spoke to him several times and I felt that he was really feeling the pressure of a home Grand Prix where you are expected to win. Mark Webber’s partner Ann Neil came out of the drivers’ area and walked across the room. One of the team said something like, “Isn’t it fantastic, Mark’s win?” To which she replied rather tartly, “I’m glad someone around here is pleased.” And indeed it did seem more like a wake than a celebration. What Helmut Marko said doesn’t make sense. He says Webber should have let Vettel by as he was faster and was under pressure from Hamilton and that this was the best way to get a 1-2 finish. Surely if Webber was slower then Webber would have been overtaken by Hamilton if he had let Vettel past. What Marko says again doesn’t add up, maybe he is saying Vettel is unable to defend as well as not being able to overtake. Helmut Marko has helped to make the disaster on track into something bigger off track. He may love Vettel but he has helped Webber gain lots of support from the fans of F1 when it comes to who they would prefer to win the title if it is to be a Red Bull driver. Webber was guilty for the incident. Seb was in front and MW had to keep the distance, because the front pilot has the right to choose the line! Did anyone ever notice what a really likeable kid Vettle is,…when he wins. Other times, not so much. Urgent message for RBR Management: Stop digging! Marko’s claim simply isn’t backed up by the actual lap times. First Webber was slowing because he had to conserve fuel, now he’s simply not fast enough? It all smells like a smear campaign. unfortunately, he came out between webber and hamilton…. Love this photo… Can you imagine them suddenly breaking out in to dance, especially the front two..
the one on the far right, probably would do a bit of a camper version.. Since when being slower is a reason to let anyone overtake you in F1 ?? Horner looked very nervous, very unconfortable on the pit lane during the race. Is he always like that ?? Even I can see it was Vittel’s fault !! Horner and Marko are two-faced, slipperly fools. Everyone now knows about their agenda now, they were too stupid to temper their comments after the incident. And is just Vettel a little upstart with an elitism complex. Webber is an honest, hard-working champion. He deserves to win the championship more than anything now, he has clearly had the edge on his “teammate” this year, but ridiculous, biased decisions are getting in the way of what should be rightfully his. He’ll rise above this mess and win in Montreal. He won’t let these three stooges block something that he has been working towards for better half of his life. You can do it Mark, everyone is behind you. My reaction to this whole article is ‘um…and???’. Absolutely none of what Marko says changes the fact that Vettel turned into Webber. If his “unlucky” protege hadn’t made that mistake he would now be leading the championship, so my heart doesn’t exactly bleed for him. And how nice of Marko to say “Mark for whatever reason was slower” without mentioning that his engine had been turned down, they seem to have problems getting their story straight over that one. Which is why I’ll read what Horner said to you tomorrow with interest, but take it with a bucketload of salt. It just seems more like damage limitation at this point – they got it BADLY wrong after the race, and its their mishandling of the situation which has sparked all this controversy over team orders in the first place. Where are the promised comments about fuel loads etc after your chat with Horner? You gotta feel for Weber’s side of the garage. The mechanics and engineers and so on putting in the late nights and all the effort – then they get to the race and find out management prefer the other guy to win . It stinks.